Lily Collins has gone from supporting roles in "The Blind Side" and "Abduction" to a starring role in "Mirror Mirror." Like the Snow White character she plays in the film, the actress says the experience of playing opposite Julia Roberts helped her move from naive to empowered. Snow White was driving hastily through West Hollywood, swerving her SUV out of a lane of cars jammed in traffic. Opportunities to make U-turns on Santa Monica Boulevard don't come frequently, so Lily Collins — who plays the classic fairy-tale princess in Friday's"Mirror Mirror" — pulled a quick illegal maneuver to minimize her time in the car. "It would have taken forever otherwise," the actress said in the parking lot of the French Market Place, a West Hollywood compound housing a restaurant and various stores selling kitschy costume jewelry and movie memorabilia. Collins' aggressive driving — in the Land Rover she got seven years ago for her 16th birthday — was about all that didn't seem to square with her guileless demeanor, the one that helped her land her first leading role as the innocent Snow White. 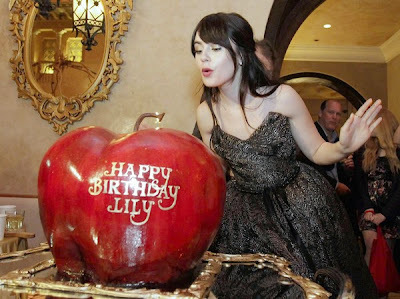 Lily Collins blows out the candle on an apple cake for her 23rd birthday at a party after the premiere of "Mirror Mirror." "But no, she doesn't look made up — and maybe that's why I keep making a joke out of her eyebrows," Singh continued. "The girl walked into the audition and looked like she just got out of bed. She looked pure." "Mirror Mirror" is the first of two Snow White adaptations to hit theaters this year. The second, out in June, is Universal's "Snow White and the Huntsman,"which features Kristen Stewart as a far more outwardly fierce heroine. While Stewart's version appears colder in her hard battle armor, Collins' is brighter, often decked out in colorful corsets and ball gowns. “Mirror Mirror” follows the cloistered princess discovering a world outside her bedroom in a light-hearted spin on the fairy tale, replete with ample court-jesting and lively action scenes. "Lily had a great sense of what we were looking for in our movie," said Bernie Goldmann, one of the film's producers. "At one point, the word 'damn' was in the script, and she said, 'I don't think Snow White should say that.' And I felt like kissing her because she had an overall awareness of who she was supposed to be and was thinking about the young girls who would see the movie."